Introducing the new RT-7700 Electric Tape Dispenser which can cut a variety of tapes in a sequence (example A: 50mm, B: 10mm etc up to 6 length settings between 5mm and 999mm). This Electronic Tape Dispenser will accept tape widths of 6~60mm and a maximum outer diameter tape roll of 300mm. 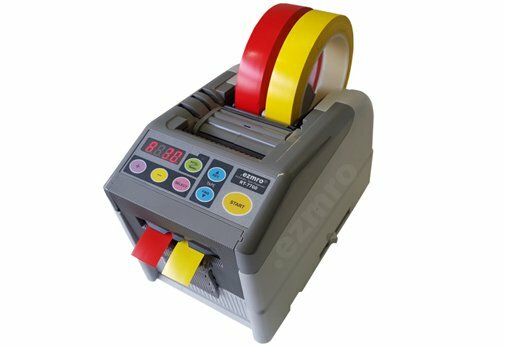 The RT7700 Electric Tape Dispenser can also dispense 2 reels of tape at the same time using the tape roll separator. The RT7700 Tape Dispenser is easy to maintain as the blade set can be changed without any tooling. You can also change the PCB, rollers and gears by just removing the lid. This RT7700 Tape Dispenser accepts the following tapes: Acetate/Glass Cloth, Double-Sided Tape, Normex, Filament, Kapton, Electrical, 3M, Pre-Stick, Cellophane, Craft Tape and many more. The RT7700 Tape Dispenser also accepts the following non-adhesive materials: Protection Film, Aluminium/Copper Foil, Tubing, Plastic Band, Magic Tape, Ribbon, Paper Tape, Insulation Film and many more. If in doubt please send samples of your material for testing at our works.